We are very excited to announce to the world the news of our engagement and our upcoming marriage, next August. This page will be a way of updating our guests on the latest information regarding our Wedding which is less than two months from now. It is also our way of letting our families abroad share in the joy, and feel a little bit of our excitement, as more news and more pictures are uploaded daily. As you might already know, most of our family is located in the Dominican Republic, a beautiful island in the Carribean, and in Cyprus, a drop of paradise in the Mediterrainian sea. We promise to provide Spanish and Greek versions of this page as soon as we get around to it. Hopefully before the wedding :-). Enjoy your visit to "Ody and Fyto's Wedding webpage"! 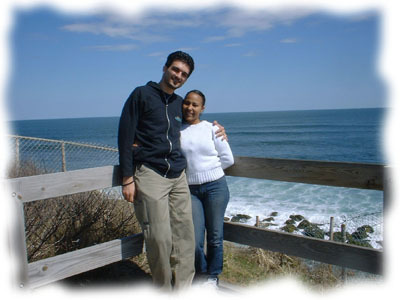 Our wedding will take place at the Montauk Lighthouse, Long Island, NY, on August 31st 2002. This is a very special location to both of us, as we explain in Our Story, along with some introductions to our selves and our families. For guest information about the wedding, including maps, directions and the day schedule, please visit our Maps and Info section. For an introduction to our wedding party, you may check the Party page. Don't forget to check our constantly updated photo album, and of course, sign our Guestbook!